Yes, it is amazing the castles in the air that can be built with paper money and deceitful manipulation of all economic data. And Madame Bernanke de Pompadour will do anything to keep King Louis XV Obama happy, including flooding markets with unlimited amounts of printed money. They both know that, in their holy alliance, they are committing a cardinal sin. But clinging to power is more important than the good of the country. An economic and social disaster is imminent for the US and a major part of the world and Bernanke de Pompadour and Louis XV Obama are praying that it won’t happen during their reign: “Après nous le déluge”. The Gini coefficient of income and wealth [chart below] is now reaching extremes in many countries. This measures the inequality between the rich and the poor. 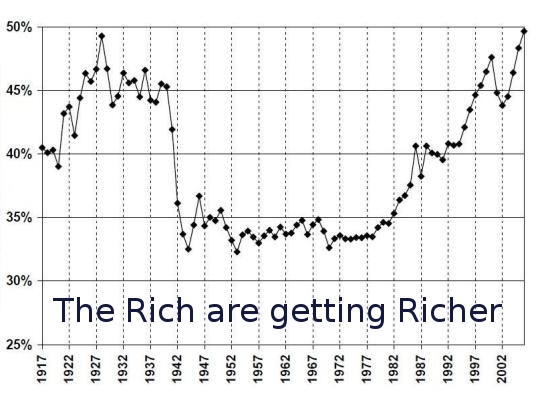 In the US the Gini coefficient is now at the same level as in the 1920s before the depression. In countries like the US, the rich are getting richer whilst 45 million people live below the poverty line, 43 million receive food stamps and over 700,000 are homeless. With a real unemployment rate of 22% and urban youth unemployment much higher, the US will soon experience social unrest. Greenspan was one such individual. During his 19 years as Chairman of the Fed, he could have limited the economic and social damage that the US would suffer. Instead he took every single measure possible to ensure that there would be a catastrophe with uncontrollable consequences. But we shouldn’t just blame the incompetence of Greenspan. It was sickening to watch every sycophantic congressman and senator licking Greenspan’s boots and praising his wisdom. Because Greenspan’s money printing and incompetent interest rate management created one of the biggest financial bubbles in world economic history. But the politicians loved this. It made the stock market boom, and house prices surge. Thus the politicians were all loved by their voters who did not understand the dire consequences that were looming. And Bernanke de Pompadour is continuing the same disastrous policies of creating money out of thin air. 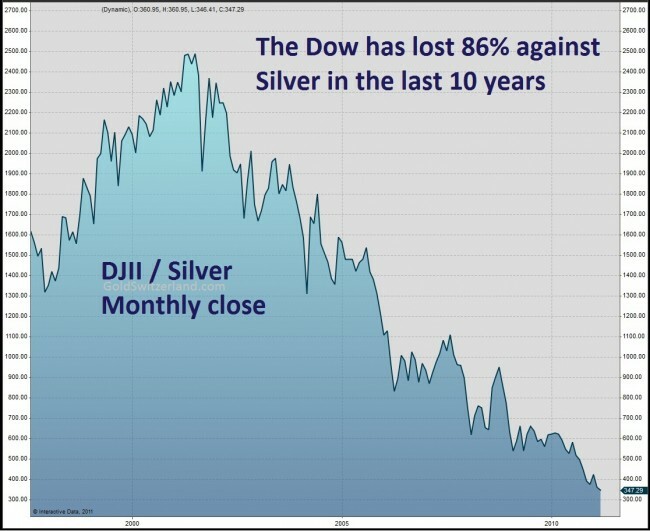 When will they ever learn that creating money out of thin air and running astronomical deficits that never will be repaid with normal money leads to the road of total ruin? When will they ever learn? The very sad answer is that they won’t and therefore they are leading the world into a hyperinflationary depression that will have uncontrollable and cataclysmic consequences for current and future generations. It is virtually certain that these riots will spread to many countries in the Middle East, Africa and the developing world. This will lead to new regimes and new political orders that could either be far left or far right politically or religious extremists. But the new regimes will not be in a position to change the root of the problem which is famine and poverty. In Egypt for example there has been a quiet military coup. It is unlikely that a democratic regime will take over from the military. So the people will protest again and again. And this will be the same in most countries. Eventually the people will take the law into their own hands since no regime will be able to give them the food that they need. 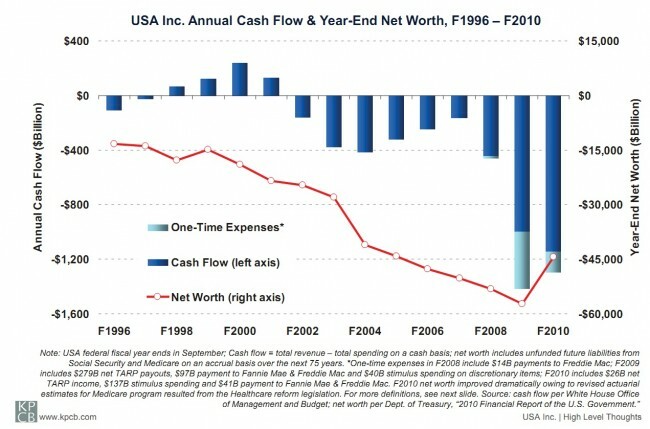 With years of negative net worth and negative cash flow, the US is bankrupt today. The Federal deficit is forecast to increase by at least another $ 5 trillion in the next 5-7 years. Add to this the State deficits, the Municipal and City deficits that are rising at a galloping rate and we have a country that is going to haemorrhage to death in the next few years. One wonders when the totally ineffective and clueless rating agencies are going to fathom this. Not that it will matter if they once do. One also wonders what Mme Bernanke de Pompadour and his court are thinking. “She” and her courtiers should have above average intelligence and could not possibly avoid seeing the facts that we all see today (of course, some of us have seen it coming for over a decade). But “she” has to please her master King Louis XV Obama and her devotion to the king goes above all reasonable common sense, or rationale. So the two of them will continue to crank up the printing press and drown their people and the world in worthless paper. In January 2009, we warned investors that long term interest rates were bottoming. Since then the 30 year bond yield is up from 2.6% to 4.6% an 80% rise. But more importantly the 30 year is currently in the process of breaking a 17 year downtrend line which dates back to 1994. 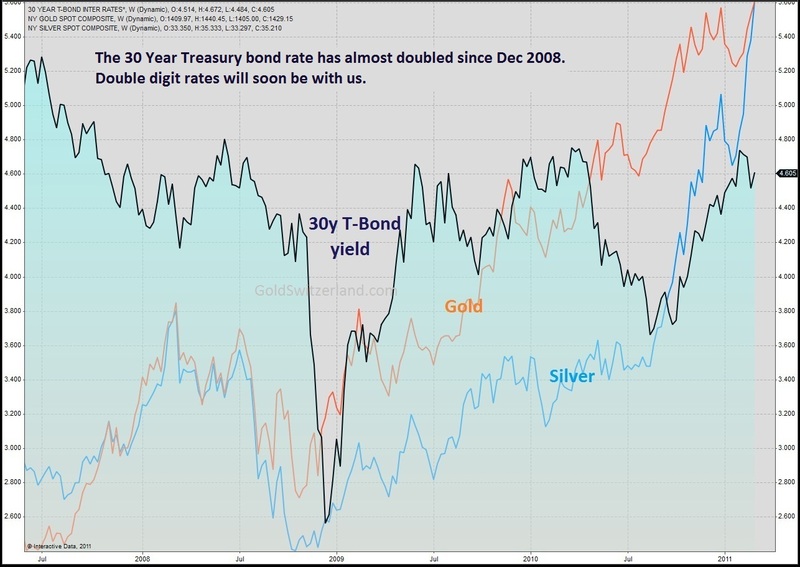 This confirms that rates will now start a major and rapid rise which is likely to reach the mid-teens or higher. Governments will attempt to keep short rates low due to weak economies but eventually the rising long rates will put strong upward pressure on the short rates. So the flight to government bonds that we have seen in the last few years will soon reverse into a massive rush for the exit. 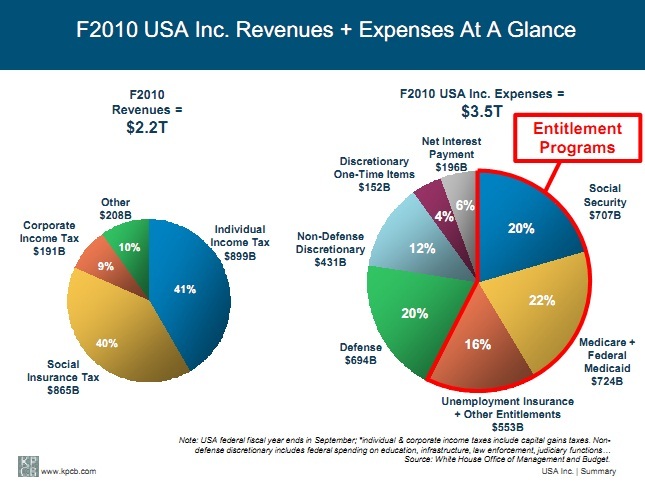 This will coincide with rapidly increasing financing requirements by the US, UK, EU and many other governments. The poisonous concoction of rising rates and rising financing needs will create a vicious circle of collapsing bond markets and unsustainably high financing cost. This will continue to drive interest rates even higher which will further increase deficits and necessitate even faster running printing presses. 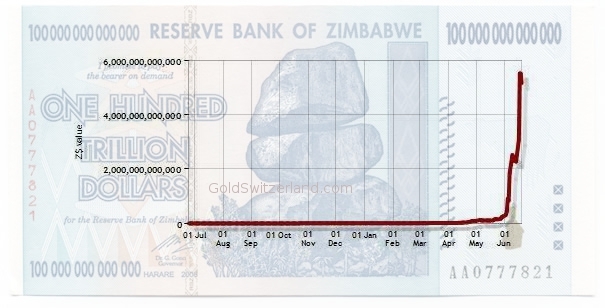 Add to that a collapsing currency and the hyperinflationary picture is complete. It is our very strong view that investors should exit bond markets entirely if they want to avoid a total destruction of their assets. 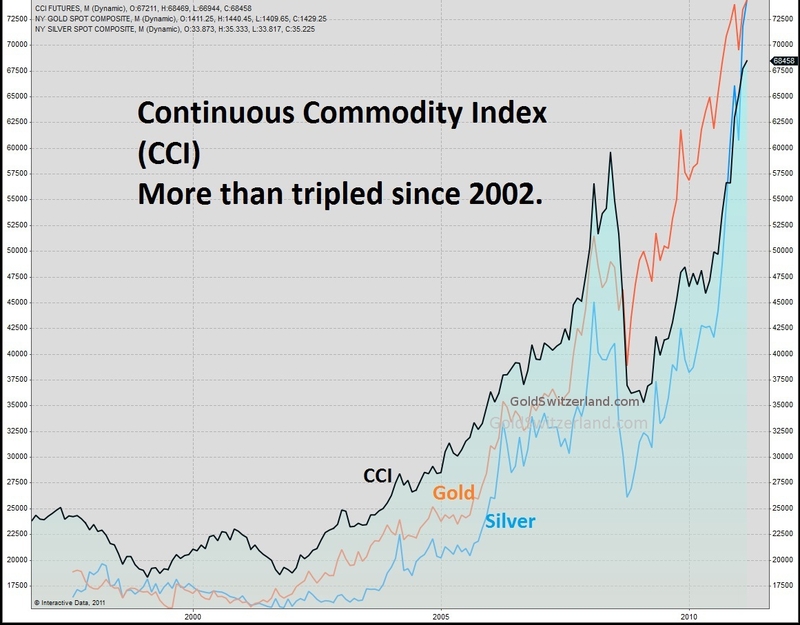 GoldSwitzerland is the precious metals investment division of Matterhorn Asset Management AG which specializes in wealth management and wealth preservation and is part of Aquila & Co AG, one of Switzerland’s largest independent asset management groups. This entry was posted in Collapse 2011, Economic Collapse and tagged collapse, Economic Collapse, financial collapse, Greater Depression, propaganda. Bookmark the permalink.